The beautiful Topas Ecolodge is located 18 km from Sapa, deep in the Hoang Lien Mountains. Our 25 bungalows overlook the picturesque valleys, home to Red Dao and Tay ethnic minority people. Enjoy the return Hanoi – Sapa ride with our luxurious Topas Mountain Express limousine; get on your high quality mountain bike and ride along winding mountain roads and experience the ethnic communities and their unique cultures, relax with breathtaking mountain views at the quiet lodge. You will start the afternoon cycling trip by following the main road for three kilometres to Lech village of the Red Dao minority, enjoying the magnificent valley view on the way. Here you will leave your bikes and take a short walk on dirt road to visit a traditional Red Dao family and experience the culture of the minority villagers who are living peacefully in the same way as their ancestors. Back at the parking place, you will take a further ride to the Moi village and learn how the women in their doorways are doing their embroidery, which the Red Dao people are very famous for. From the village, you head back to the Lodge. Approx: Grade: easy/ 1.5 hours biking. 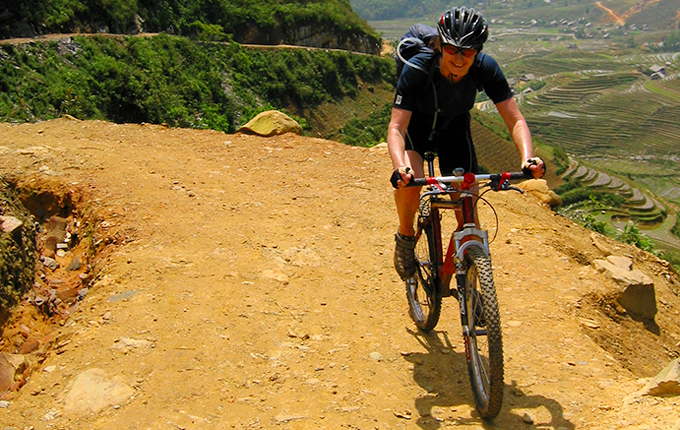 You will start from Topas Ecolodge by cycling on a quiet road for a while before enjoying a descent to Ban Ho village. At the bottom of the valley you will meet the Tay minority people, the largest ethnic minority group living in Sapa. They are famous with their beautiful stilt houses and you will be warmly welcomed to visit their home, experience their daily life of farming and fishing in the river. Leaving Ban Ho village your ride becomes a bit more challenging with some ascending parts on steep winding road. At Thanh Phu village, also inhabited by Tay minority, your lunch is served at a nice local family where you enjoy the valley view while tasting the local foods. If you would like to stay in our Executive bungalows and/or upgrade to romantic package, please request this upon booking.